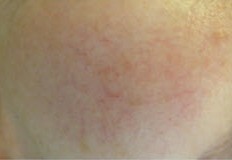 Naevus or Naevi (plural) literally means blemish or lump on the skin. 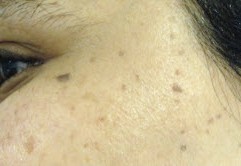 A melanocytic naevus is simply a pigmented mole. The average mole is due to a localised overgrowth of pigment cells (melanocytes) and blood vessels. Moles may be pigmented or non pigmented and maybe present at birth (congenital) or appear during childhood or early adulthood (acquired). Some however appear to be hormone dependant and occur for the first time during puberty, pregnancy or women taking the contraceptive pill. 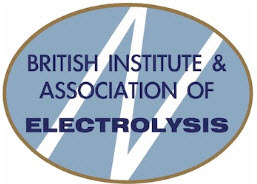 They may arise from the dermis (intradermally) , the epidermis (junctional) or both (compound) and may contain course hairs. Any hairs will usually be strong and dark due to the plentiful supply of both blood and melanin. 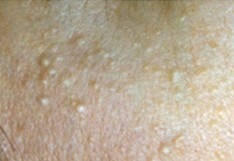 Every adult has a few moles,usually between 15 and 20. 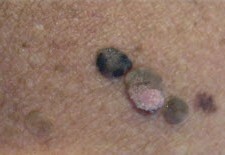 Those with numerous moles are at a higher risk of developing malignant melanoma. 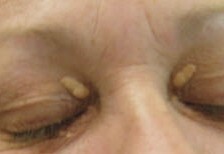 Hairs can be removed from moles. 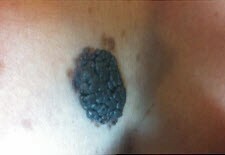 Moles generally will also need a few treatments at monthly intervals.